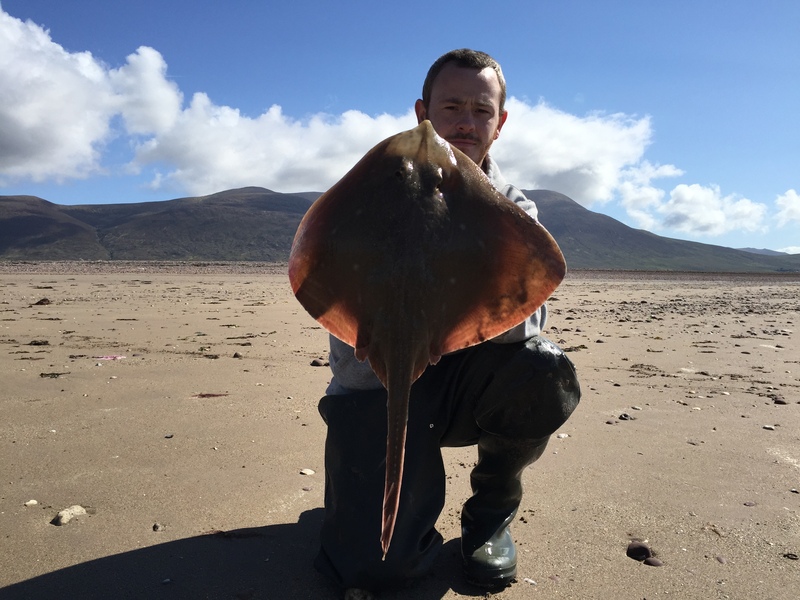 Not so long ago, the lads from ‘Ireland Fishing Diaries’ asked me to do a write up on my weekend in Tralee bay targeting and catching my first stingray. 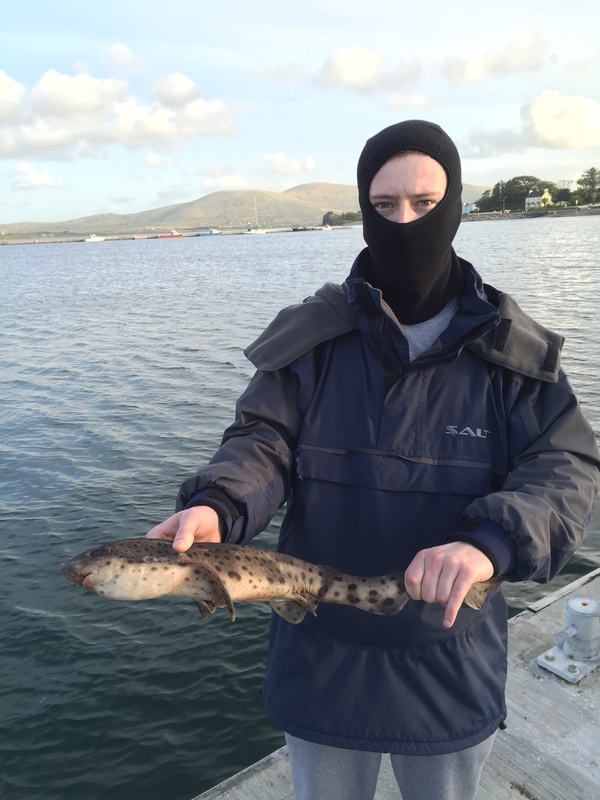 At the end of the piece I said I’d be back down to Tralee to try get a stinger from the shore. Little did I know that about 3 weeks later I’d do just that. Not only did we get the stingers from the shore, we had a session I don’t think I’ll ever forget. Myself and my two cousins Paul and Gibbo hit the road for Kerry late on a Saturday afternoon. 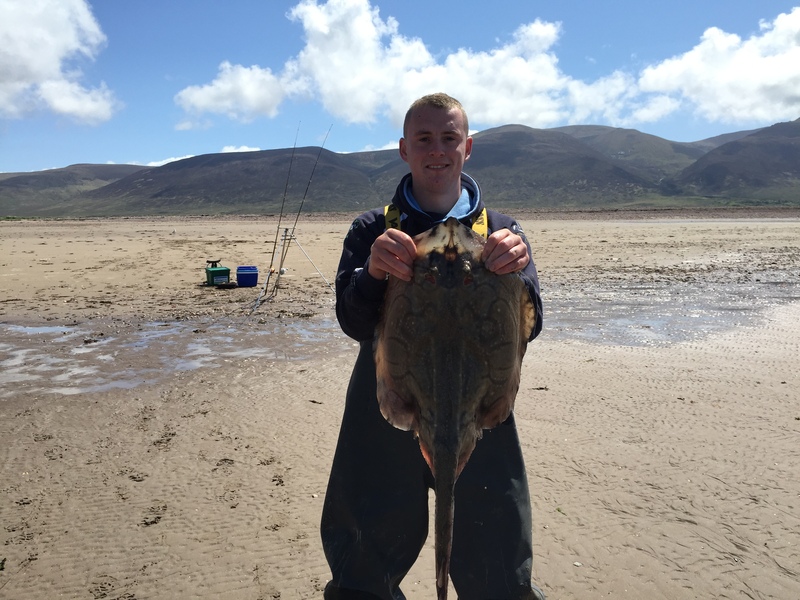 Our plan was to go to one of our bull Huss marks and fish that for a few hours before heading to Fenit to meet up with our friends Eugene and Susan who were kind enough to put us up for the night. We spend about an hour and a half fishing for Huss. On Paul’s first cast he struck into a decent fish, it gave him a ferocious fight and when he got the fish to the surface I went to land it but just as I put my hand on the leader the hook snapped and the fish swam away like a bullet. It would have been the biggest of the session, we put it at about 9lb. We were sick but without delay Gibbo’s rod started knocking, he was now into a huss. I went to land the fish hoping for a better result than the last time but snap, this time the hook popped out of the fishes lip. We couldn’t believe it. The lads thought I had a scissors or pliers up my sleeve. We all got over the lost fish and managed to land one Huss each. Nothing too big but not a bad bit of action for a short session. We finally made it back to Fenit at about 11 o clock were Eugene and Susan were waiting on us, anxious to get us to ‘The west end’ their local. So we quickly changed and went off for a few pints. We all talked fishing, trying to prize as much knowledge out of Eugene about our target species, the stingray. Gibbo, Paul and Susan left after a couple of pints but me and Eugene had better plans…More pints. We planned on fishing 2 hours before and after low water which wasn’t until about 3 so we had plenty of time to recover in the morning. Anyway next morning I was surprisingly fresh so we all got up and had breakfast. 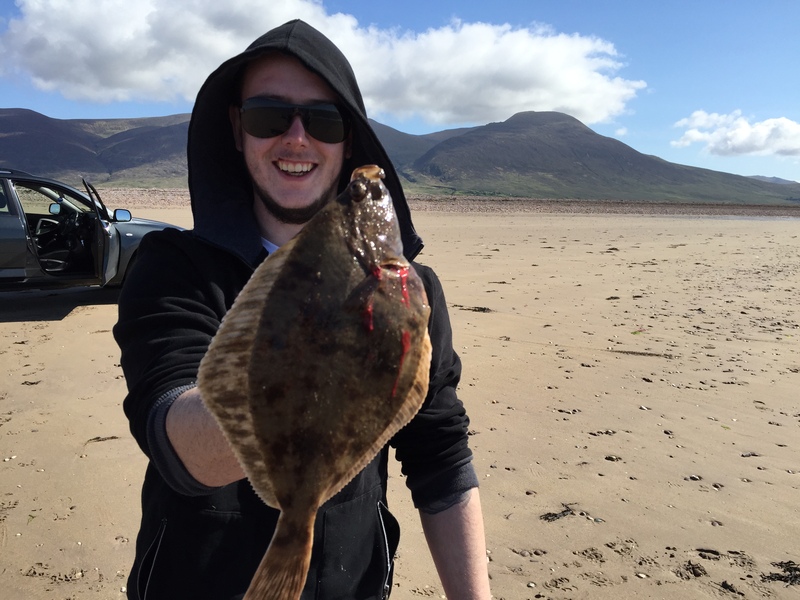 The venue we planned to fish was Derrymore point a 3.5km drive on sand, not a bother to Paul’s 4×4 Toyota RAV4. We arrived on the beach a lot earlier the planned probably about 11.30. The water was still fairly high but we set up and started fishing. We opted for pulley rigs and ‘1 up, 1 down’ rigs. I used size 2/0 cox and Rawle uptide extra. The baits were sandeel mackerel and peeler crab. I set up two rods and varied distance and bait throughout the session. 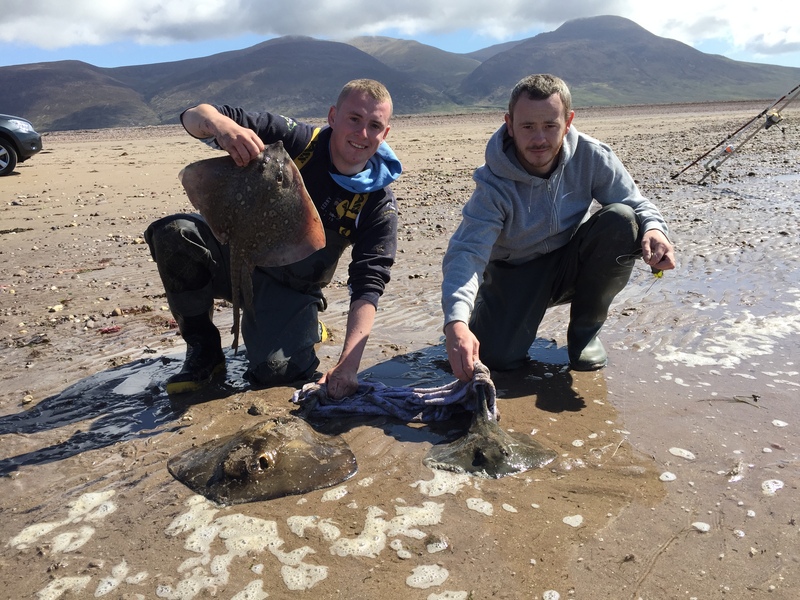 There was 4 types of Ray possible to catch in Tralee bay – undulate, thornback, painted and of course the sting ray. I had been told the thorn back, undulate and painted are usually at distance but the stingray could be as close in as 20 yards out, basking in the warm shallow water. It was a really sunny, warm, clear day. Ideal conditions for stingray now all we needed was the weed to stay clear of us and the fish to play ball. We finally got fishing and our worst nightmare had came true. Each of our lines on our first cast were smothered with weed. We stuck it out for about two hours and we had a serious chat about moving, it was unbearable. Every time my weight would set in the sand it would be swept away by a big chunk of weed. We were ready to pack up and try another beach but we looked at the time it would take us to pack up, drive to another beach and set back up, it wouldn’t have been worth it so we said we’d give it another hour and if the weed doesn’t clear and the fish don’t show we’d just admit defeat. Things were looking dull, moral was low, Paul even packed up his gear and took to enjoying the sun and listening to the radio in the jeep. The sun was the only thing that kept us there and our spirits in some way up. I decided to re-bait my two rigs with nice fresh baits and got them back out. The weed had started to become a bit more bearable and actually seemed to be clearing off. After casting out I walked up to the jeep and started chatting to the lads when I noticed my first rod buckle over. “F**k me lads, me rod” I sprinted down and struck into a fish. All of a sudden we were all smiling and I could feel the adrenaline and excitement rushing around my body… This is what I came for. I seen the Ray coming to the surface, it was an undulate… Happy days. This was my first undulate and a nice one at that, weighing 10lb. A few pictures wear taken and the fish was released. I baited back up and got it back out the and as soon as I did that I noticed my second rod getting a thump. This fight was different it felt heavier, I couldn’t tell what it was until I got it in close and gibbo shouted up “double Ray” I was chuffed but just as I had them at the waters edge my knot snapped at the rig swivel. I froze for a second before I dropped my rod and made a beeline for the water. It was a thornie and a stinger, I grabbed the thornie and dragged the two fish onto the beach, luckily the rig was still intact. From there on out I had non stop action with a total of 7 stingers 2 thornies and the undulate. I have never felt so elated, this was definitely the best session I’ve ever had. 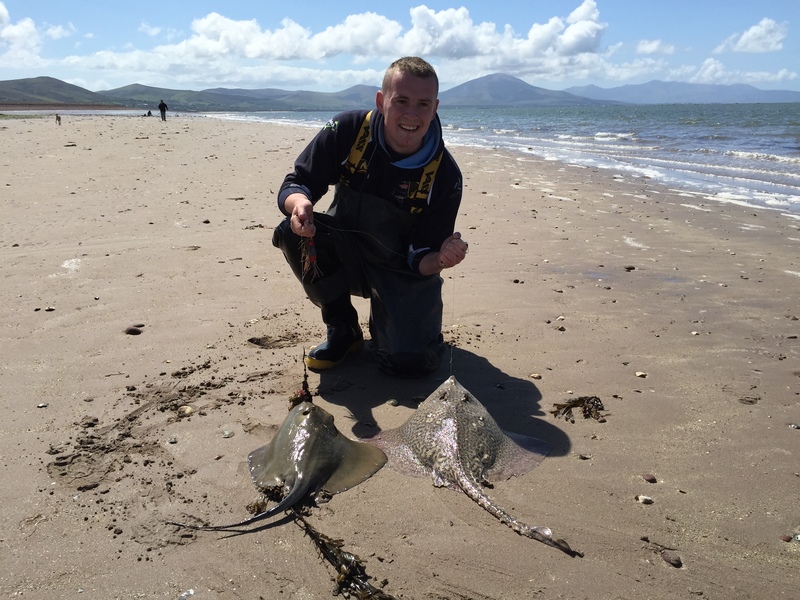 The biggest stinger was about 10lb and while I was unhooking it my second rod was bouncing away with a thorny on it so I managed to get two great pics with a brace of Ray. The background of the mountains on the Dingle peninsula made the pictures that bit more magical. Meanwhile Gibbo was fishing about 50 feet to the right of me and didn’t get a bite so he moved up to the opposite side of me and on his first cast he hooked into his very first stingray. He doesn’t smile much but he was grinning like a Cheshire Cat. Nothing like notching off a new species and to make it even more special he’d being trying for years to get one but always manages to only get painted Ray. So on his next cast he hooked into his annual painted Ray, a little beauty. After that the tide started to rise a good bit and the weed started to come back on. Things went a bit quiet and we were drained at this stage so we decided to call it a day. It was 6 o clock and we had a three and a half hour drive home. We were buzzing and the only thing I could say the whole way home was “lads I can’t get over that session”. It didn’t wear off for days.